Shui Xian Oolong Tea or wu-long tea is a very popular variety of Oolong tea and one the common favorites among Gong Fu tea drinkers. Shui Xian Oolong Tea tea can be found in most Chinese restaurants menu, where the spelling "Shui Hsien" is more commonly used. 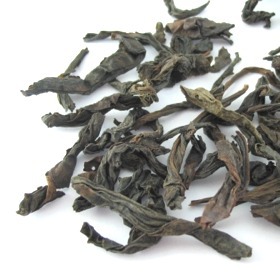 Our Shui Xian originates from the high mountains of Wu Yi Shan and is organically grown. Oolong teas from Mount Wu Yi are also referred as Yan Cha or "Rock Tea" due to the rocky terrain where the tea plants grow. No flowers were necessary to scent this delicacy. Strong and full-bodied Oolong tea with slightly roasted flavor. Traditional looking Oolong tea, with dark and curly tea leaves. I highly recommend this oolong! This is a nice shui xian. I would pay the little bit more to go for the lao cong though. Still this one is worth a try for the price. Not a very good example of Shui Xian .... Could not detect any of the usual flavor or aroma nuances of Shui Xian.